How to say yes to building self-confidence. My first solo excursion was a fashion show at the Galeries la Fayette in the 9eme arrondissement where real professional models were walking real designer clothing, and I was sitting in the front row, clapping, ooing and ahing you know the whole chabang. After Which I went shopping, rooftop gazing across the city of Paris and just being me. I proceeded to taking it up a notch with buying myself some flowers, rose wine and ingredients to prepare a fancy meal back at my apartment situated in the heart of the Marais, and then sit in my tub; because this girl wanted to embrace every moment. As a life and style blogger at that time, I wanted to immerse myself in what it would feel like and I did. And it felt friggin good! 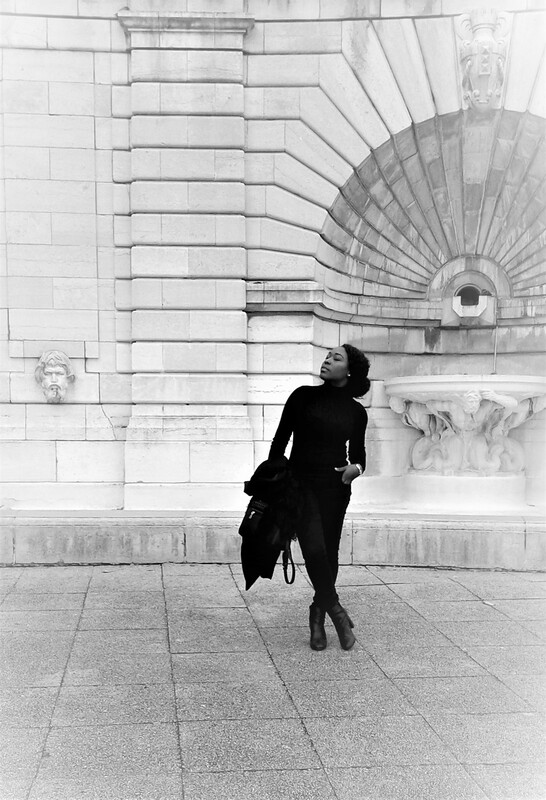 An introverted Caribbean girl in Paris. That was me “July 2015”. My first transatlantic flight to a place where my grasp of the language was still minimal, I knew 2 persons there “whom I’d never met”, and I was still somewhat a bit naive. On the flip side, I was excited, I was giddy and I couldn’t stop daydreaming. How did I manage to get here? I’m sure the locals could tell a mile away that I was a tourist because I smiled at almost everyone and said bonjour 50 times a day” – and yes, not everyone shows teeth.None the less, I had an agenda, I had adventure on my mind and I couldn’t wait to explore, eat and of course take 1 million photos. And so we did for the first week until my travel partner and I had a disagreement about what I should and should not be doing, thinking and how I should and should not be living which did not end very pretty but not violently! “imagine the scene of 2 foreign girls in the city of joie de vivre”. My confidence lesson came in that moment. Because in that moment, I realized that I had allowed others to control, rule, and take advantage of my innocence. I never stood up for myself, I was a major cry baby, and I always loved pleasing others before I pleased myself. That moment shared with me my inner power to for once say NO! No to being ridiculed about my desires, no to being judged about loving what I did openly, and no to being taken advantage of anymore. Many women are fascinated with the idea of travel and luxury without ever giving themselves the opportunity to experience it. The sad reality is that they “myself included at a time” are so consumed by what others will think, do or say that they end up not truly living. They end up burying those bold desires to live an elegant lifestyle “on their own terms” as a result of fear and the old scarcity programming every woman has been privy to. But what if you were given a magic wand just for one day. To do as you please. To feel as you wish, To think act and live as you desire, would you take that chance? I can bet that you’re nodding your head in this very moment. So why not now? Why not this moment? Life is an extremely precious gift. We as humans and women especially we have the gift of deep emotions. To love, to feel, to embrace, to live our ultimate life but “if we choose to”. When we do what we love, when to act from our essence we truly live life. Growth only extends it’s invitation to us when we begin to do things differently. When we push our own boundaries, when we stop saying “maybe later” and instead dive in now. Growth shows you how strong, how confident, how much power YOU have deeply embedded within you. Presence comes from the essence of our hearts. Presence gives us the gift of truly living and not just being alive. Presence gives us the opportunity to have more joie de vivre, more bliss, more abundance. Presence shows us how wealthy we already are. Of course my darling, you do not have to visit Paris to give yourself the gift of confidence to say yes. You can do this wherever you are in this very moment. The choice is yours to decide. But I do know what my definition of living fully and being a success looks and feels like. What’s yours? Let’s find out which disempowering feminine being you’re embodying in this quiz to get started and what to do about her! Link is in the profile. Menellia is a Success Coach & Mindset Makeover Maven To Female Coaches & Creative Fempreneurs; & a current Thrive Global & Sivana East contributor. Hailing & residing from the beautiful Caribbean island of Saint Lucia, Menellia’s Mission is to empower women to design and create lives they are wildly passionate about. Her sweet spot is helping women release the limitations & ugly scarcity paradigm they’re holding unto & replacing that with powerful positive energy & high performing actions leading them to the passionate lives & businesses they’re desiring to create. Combining her Francophile approach and Caribbean essence, she uses her personal experiences of going from deplete to thriving, her mastery of using the law of attraction and vibration, her trainings with world-renowned success and life coaches and her successful track record working with global women; as the foundation to provide daily inspiration to women through her blogcast , her digital courses & her elite level private mentorship program. It’s a serious love affair with yourself & your business. A true self-made woman, Menellia taught herself how to build her first business purely by accident. 2 years later, her brand is staged to reach its first 6 figures by the end of 2019! Menellia lives by the motto - to create a life you never had you must become a woman you’ve never been! To learn more about Menellia visit www.menelliavalcent.com & If one of your major blocks is simply having confidence in yourself to begin the process, you might enjoy my CEO lady Powertalk where you will learn how to elevate your life & pursue your goals with more confidence. Get instant access to it right here! Also, don’t forget to join the Permission To Elevate Mastermind to gain access to my free live training sessions.